Description: Sexes similar. Dark brown with buffy spotting above, lighter on head; white below with streaking on neck, breast and sides. Relatively shorter greenish legs. Prominent white eye-ring and short white eyestripe from eye to bill. In flight, shows dark underwings and dark central tail feathers. 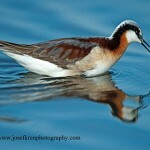 Habitat: Migrants can be found on wooded ponds and streams, and also on flooded meadows. 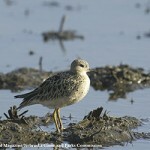 Where in Nebraska: Common to occasional spring and fall migrant across the state. 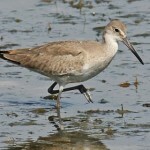 More common in the east and less common in treeless areas. 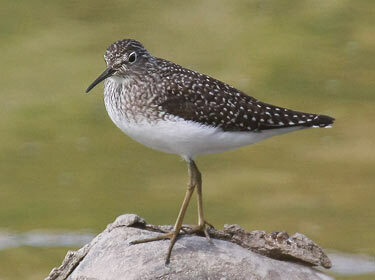 Fun Facts: Unlike other shorebirds that scrape a nest on the ground, The Solitary Sandpiper is parasitic. It lays its eggs in several other tree nests of songbirds in particular the American Robin, Rusty Blackbird, Eastern Kingbird, Gray Jay, and Cedar Waxwing.